The Pleiades (/ˈplaɪ.ədiːz, ˈpliːə-/), also known as the Seven Sisters and Messier 45, are an open star cluster containing middle-aged, hot B-type stars located in the constellation of Taurus. It is among the nearest star clusters to Earth and is the cluster most obvious to the naked eye in the night sky. The name of the Pleiades comes from Ancient Greek. It probably derives from plein ("to sail") because of the cluster's importance in delimiting the sailing season in the Mediterranean Sea: "the season of navigation began with their heliacal rising". However, in mythology the name was used for the Pleiades, seven divine sisters, the name supposedly deriving from that of their mother Pleione and effectively meaning "daughters of Pleione". In reality, the name of the star cluster almost certainly came first, and Pleione was invented to explain it. The Pleiades are a prominent sight in winter in the Northern Hemisphere, and are easily visible out to mid-Southern latitudes. They have been known since antiquity to cultures all around the world, including the Celts, Hawaiians (who call them Makaliʻi ), Māori (who call them Matariki), Aboriginal Australians (from several traditions), the Persians, the Arabs (who called them Thurayya ), the Chinese (who called them 昴 mǎo), the Quechua, the Japanese, the Maya, the Aztec, the Sioux, the Kiowa, and the Cherokee. In Hinduism, the Pleiades are known as Krittika and are associated with the war-god Kartikeya. They are also mentioned three times in the Bible. Galileo's drawings of the Pleiades star cluster from Sidereus Nuncius. Image courtesy of the History of Science Collections, University of Oklahoma Libraries. 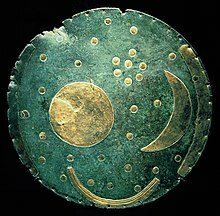 The earliest known depiction of the Pleiades is likely a Northern German bronze age artifact known as the Nebra sky disk, dated to approximately 1600 BC. The Babylonian star catalogues name the Pleiades MULMUL (𒀯𒀯), meaning "stars" (literally "star star"), and they head the list of stars along the ecliptic, reflecting the fact that they were close to the point of vernal equinox around the 23rd century BC. The Ancient Egyptians may have used the names "Followers" and "Ennead" in the prognosis texts of the Calendar of Lucky and Unlucky Days of papyrus Cairo 86637. Some Greek astronomers considered them to be a distinct constellation, and they are mentioned by Hesiod's Works and Days, Homer's Iliad and Odyssey, and the Geoponica. 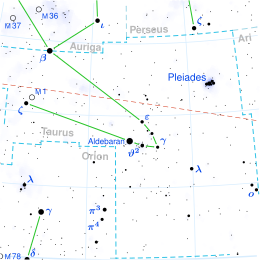 Some scholars of Islam suggested that the Pleiades (ath-thurayya) are the "star" mentioned in Sura An-Najm ("The Star") of the Quran. In Japan, the constellation is mentioned under the name Mutsuraboshi ("six stars") in the 8th century Kojiki. The constellation is now known in Japan as Subaru ("to unite"). It was chosen as the brand name of Subaru automobiles to reflect the origins of the firm as the joining of five companies, and is depicted in the firm's six-star logo. The Pleiades have long been known to be a physically related group of stars rather than any chance alignment. 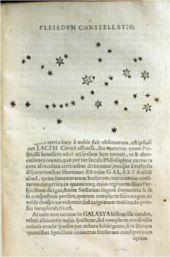 John Michell calculated in 1767 that the probability of a chance alignment of so many bright stars was only 1 in 500,000, and so surmised that the Pleiades and many other clusters of stars must be physically related. When studies were first made of the stars' proper motions, it was found that they are all moving in the same direction across the sky, at the same rate, further demonstrating that they were related. Measurements of the distance have elicited much controversy. Results prior to the launch of the Hipparcos satellite generally found that the Pleiades were about 135 parsecs away from Earth. Data from Hipparcos yielded a surprising result, namely a distance of only 118 parsecs by measuring the parallax of stars in the cluster—a technique that should yield the most direct and accurate results. Later work consistently argued that the Hipparcos distance measurement for the Pleiades was erroneous. In particular, distances derived to the cluster via the Hubble Space Telescope and infrared color-magnitude diagram fitting (so-called "spectroscopic parallax") favor a distance between 135 and 140 pc; a dynamical distance from optical interferometric observations of the Pleiad double Atlas favors a distance of 133–137 pc. However, the author of the 2007–2009 catalog of revised Hipparcos parallaxes reasserted that the distance to the Pleiades is ~120 pc and challenged the dissenting evidence. Recently, Francis and Anderson proposed that a systematic effect on Hipparcos parallax errors for stars in clusters biases calculation using the weighted mean and gave a Hipparcos parallax distance of 126 pc and photometric distance 132 pc based on stars in the AB Doradus, Tucana-Horologium, and Beta Pictoris moving groups, which are all similar in age and composition to the Pleiades. Those authors note that the difference between these results can be attributed to random error. More recent results using very-long-baseline interferometry (VLBI) (August 2014) and preliminary solutions using Gaia Data Release 1 (September 2016) and Gaia Data Release 2 (August 2018), determine distances of 136.2 ± 1.2 pc, 134 ± 6 pc 136.2 ± 5.0 pc, respectively. Although the Gaia Data Release 1 team was cautious about their result, the VLBI authors assert "that the Hipparcos measured distance to the Pleiades cluster is in error". For another distance debate see Polaris#Distance, also with a different measurement from Hipparcos, although this time it suggested a farther distance. The cluster core radius is about 8 light years and tidal radius is about 43 light years. The cluster contains over 1,000 statistically confirmed members, although this figure excludes unresolved binary stars. Its light is dominated by young, hot blue stars, up to 14 of which can be seen with the naked eye depending on local observing conditions. The arrangement of the brightest stars is somewhat similar to Ursa Major and Ursa Minor. The total mass contained in the cluster is estimated to be about 800 solar masses and is dominated by fainter and redder stars. Ages for star clusters can be estimated by comparing the Hertzsprung–Russell diagram for the cluster with theoretical models of stellar evolution. Using this technique, ages for the Pleiades of between 75 and 150 million years have been estimated. The wide spread in estimated ages is a result of uncertainties in stellar evolution models, which include factors such as convective overshoot, in which a convective zone within a star penetrates an otherwise non-convective zone, resulting in higher apparent ages. Another way of estimating the age of the cluster is by looking at the lowest-mass objects. In normal main-sequence stars, lithium is rapidly destroyed in nuclear fusion reactions. Brown dwarfs can retain their lithium, however. Due to lithium's very low ignition temperature of 2.5 × 106 K, the highest-mass brown dwarfs will burn it eventually, and so determining the highest mass of brown dwarfs still containing lithium in the cluster can give an idea of its age. Applying this technique to the Pleiades gives an age of about 115 million years. The cluster is slowly moving in the direction of the feet of what is currently the constellation of Orion. Like most open clusters, the Pleiades will not stay gravitationally bound forever. Some component stars will be ejected after close encounters with other stars; others will be stripped by tidal gravitational fields. Calculations suggest that the cluster will take about 250 million years to disperse, with gravitational interactions with giant molecular clouds and the spiral arms of our galaxy also hastening its demise. With larger telescopes, the nebulosity around some of the stars can be easily seen; especially when long-exposure photographs are taken. Under ideal observing conditions, some hint of nebulosity around the cluster may even be seen with small telescopes or average binoculars. 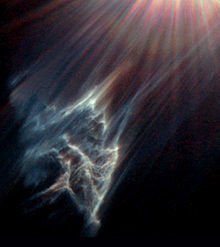 It is a reflection nebula, caused by dust reflecting the blue light of the hot, young stars. ^ a b c d e "Cl Melotte 22". SIMBAD. Centre de données astronomiques de Strasbourg. Retrieved 2007-04-20. ^ a b c Van Leeuwen, F. (2009). 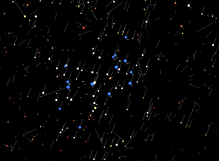 "Parallaxes and proper motions for 20 open clusters as based on the new Hipparcos catalogue". Astronomy and Astrophysics. 497 (1): 209–242. arXiv:0902.1039. Bibcode:2009A&A...497..209V. doi:10.1051/0004-6361/200811382. ^ a b c d Majaess, Daniel J.; Turner, David G.; Lane, David J.; Krajci, Tom (2011). "Deep Infrared ZAMS Fits to Benchmark Open Clusters Hosting delta Scuti Stars". Journal of the American Association of Variable Star Observers (Jaavso). 39 (2): 219. arXiv:1102.1705. Bibcode:2011JAVSO..39..219M. ^ a b Percival, S. M.; Salaris, M.; Groenewegen, M. A. T. (2005). "The distance to the Pleiades. Main sequence fitting in the near infrared". Astronomy and Astrophysics. 429 (3): 887–894. arXiv:astro-ph/0409362. Bibcode:2005A&A...429..887P. doi:10.1051/0004-6361:20041694. ^ a b Zwahlen, N.; North, P.; Debernardi, Y.; Eyer, L.; et al. (2004). "A purely geometric distance to the binary star Atlas, a member of the Pleiades". Astronomy and Astrophysics Letters. 425 (3): L45. arXiv:astro-ph/0408430. Bibcode:2004A&A...425L..45Z. doi:10.1051/0004-6361:200400062. ^ Gibson, S.J. ; Nordsieck, K.H. (2003). "The Pleiades Reflection Nebula. II. Simple Model Constraints on Dust Properties and Scattering Geometry". The Astrophysical Journal. 589 (1): 362–377. Bibcode:2003ApJ...589..362G. doi:10.1086/374590. ^ Kroupa, Pavel; Aarseth, Sverre; Hurley, Jarrod (2001). "The formation of a bound star cluster: From the Orion nebula cluster to the Pleiades". Monthly Notices of the Royal Astronomical Society. 321 (4): 699–712. arXiv:astro-ph/0009470. Bibcode:2001MNRAS.321..699K. doi:10.1046/j.1365-8711.2001.04050.x. ^ Gendler, Robert (2006). A Year in the Life of the Universe: A Seasonal Guide to Viewing the Cosmos. Voyageur Press. p. 54. ISBN 978-1610603409. ^ "Pleiad, n." OED Online. Oxford University Press, December 2014. Web. 20 January 2015. ^ Robin Hard, The Routledge Handbook of Greek Mythology (London: Routledge, 2004), p. 518. ^ Makemson, Maud. "Hawaiian Astronomical Concepts" (PDF). Hokulea.com. Retrieved 31 October 2018. ^ Allen, Richard Hinckley (1963) . Star Names: Their Lore and Meaning (Reprint ed.). New York, NY: Dover Publications Inc. ISBN 978-0-486-21079-7. ^ Andrews, Munya (2004). The Seven Sisters of the Pleiades: Stories from Around the World. Spinifex Press. pp. 149–152. ISBN 978-1876756451. ^ Kracht, Benjamin (2017). Kiowa Belief and Ritual. University of Nebraska Press. pp. 63, 75, 139, 189. ISBN 978-1496201461. ^ "BBC - Science & Nature - Horizon - Secrets of the Star Disc". BBC. 2004. Retrieved 2008-03-25. ^ Jetsu, L.; Porceddu, S. (2015). "Shifting Milestones of Natural Sciences: The Ancient Egyptian Discovery of Algol's Period Confirmed". PLoS ONE. 10 (12): e.0144140 (23pp). arXiv:1601.06990. Bibcode:2015PLoSO..1044140J. doi:10.1371/journal.pone.0144140. PMC 4683080. PMID 26679699. ^ Theodossiou, E.; Manimanis, V. N.; Mantarakis, P.; Dimitrijevic, M. S. (2011). "Astronomy and Constellations in the Iliad and Odyssey". Journal of Astronomical History and Heritage. 14 (1): 22. Bibcode:2011JAHH...14...22T. ISSN 1440-2807. ^ Abdullah Yusuf Ali (1934). The Holy Qur'an — Translation and Commentary. ISBN 978-1-902480-01-5. ^ Andrews, Munya (2004). The Seven Sisters of the Pleiades: Stories from Around the World. North Melbourne, Victoria, Australia: Spinifex Press. ISBN 9781876756451. Retrieved August 21, 2017. ^ "Fuji Heavy Industries Changes Name to Subaru". automotive-fleet.com. Automotive Fleet Magazine. May 12, 2016. Retrieved 24 June 2016. ^ Michell J. (1767). "An Inquiry into the probable Parallax, and Magnitude, of the Fixed Stars, from the Quantity of Light which they afford us, and the particular Circumstances of their Situation". Philosophical Transactions. 57: 234–264. Bibcode:1767RSPT...57..234M. doi:10.1098/rstl.1767.0028. ^ a b c Soderblom D. R.; Nelan E.; Benedict G. F.; McArthur B.; et al. (2005). "Confirmation of Errors in Hipparcos Parallaxes from Hubble Space Telescope Fine Guidance Sensor Astrometry of the Pleiades". Astronomical Journal. 129 (3): 1616–1624. arXiv:astro-ph/0412093. Bibcode:2005AJ....129.1616S. doi:10.1086/427860. ^ Turner, D. G. (1979). "A reddening-free main sequence for the Pleiades cluster". Publications of the Astronomical Society of the Pacific. 91: 642–647. Bibcode:1979PASP...91..642T. doi:10.1086/130556. ^ a b Pan, X. (2004). "A distance of 133-137 parsecs to the Pleiades star cluster". Nature. 427 (6972): 326–328. Bibcode:2004Natur.427..326P. doi:10.1038/nature02296. PMID 14737161. ^ Francis C.; Anderson E. (2012). "XHIP II: clusters and associations". Astronomy Letters. 1203 (11): 4945. arXiv:1203.4945. Bibcode:2012AstL...38..681F. doi:10.1134/S1063773712110023. ^ a b Abramson, Guillermo (20 August 2018). "The Distance to the Pleiades According to Gaia DR2". Research Notes of the AAS. 2 (3): 150. Bibcode:2018RNAAS...2c.150A. doi:10.3847/2515-5172/aada8b. ^ Van Leeuwen, Floor (1999). "HIPPARCOS distance calibrations for 9 open clusters". Astronomy and Astrophysics. 341: L71. Bibcode:1999A&A...341L..71V. ^ a b Adams, Joseph D.; Stauffer, John R.; Monet, David G.; Skrutskie, Michael F.; et al. (2001). "The Mass and Structure of the Pleiades Star Cluster from 2MASS". Astronomical Journal. 121 (4): 2053–2064. arXiv:astro-ph/0101139. Bibcode:2001AJ....121.2053A. doi:10.1086/319965. ^ Moraux, E.; Bouvier, J.; Stauffer, J. R.; Cuillandre, J.-C. (2003). "Brown in the Pleiades cluster: Clues to the substellar mass function". Astronomy and Astrophysics. 400 (3): 891–902. arXiv:astro-ph/0212571. Bibcode:2003A&A...400..891M. doi:10.1051/0004-6361:20021903. ^ Basri G.; Marcy G. W.; Graham J. R. (1996). "Lithium in Brown Dwarf Candidates: The Mass and Age of the Faintest Pleiades Stars". Astrophysical Journal. 458: 600. Bibcode:1996ApJ...458..600B. doi:10.1086/176842. ^ Ushomirsky, G.; Matzner, C.; Brown, E.; Bildsten, L.; et al. (1998). "Light-Element Depletion in Contracting Brown Dwarfs and Pre-Main-Sequence Stars". Astrophysical Journal. 497 (1): 253–266. arXiv:astro-ph/9711099. Bibcode:1998ApJ...497..253U. doi:10.1086/305457. ^ Converse, Joseph M. & Stahler, Steven W. (2010). "The dynamical evolution of the Pleiades". Monthly Notices of the Royal Astronomical Society. 405 (1): 666–680. arXiv:1002.2229. Bibcode:2010MNRAS.405..666C. doi:10.1111/j.1365-2966.2010.16505.x. ^ Gibson, Steven J.; Nordsieck, Kenneth H. (2003). "The Pleiades Reflection Nebula. II. Simple Model Constraints on Dust Properties and Scattering Geometry". Astrophysical Journal. 589 (1): 362–377. Bibcode:2003ApJ...589..362G. doi:10.1086/374590.